Things are starting to happen outside, so yes, I do believe spring has finally arrived and I do not believe we will get any more snow - knock wood. Such a late spring that the trees are still bare and even the buds still barely visible, the lawn has just started becoming green again and there's still ice in the compost bin. 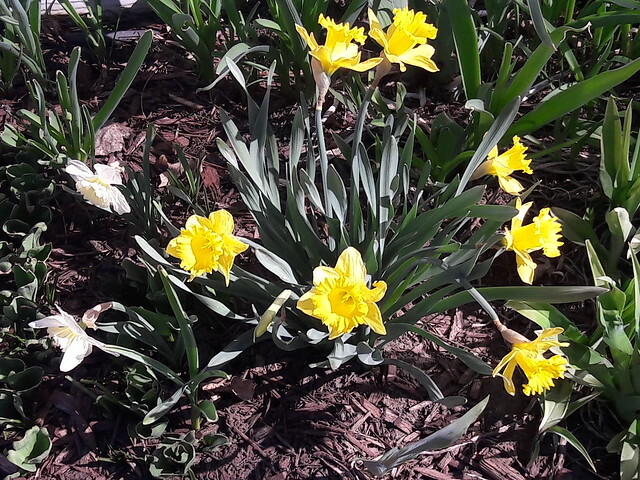 But better late than never as the usually early flowers are blooming, the air is clean and crisp yet warmer and projects await! 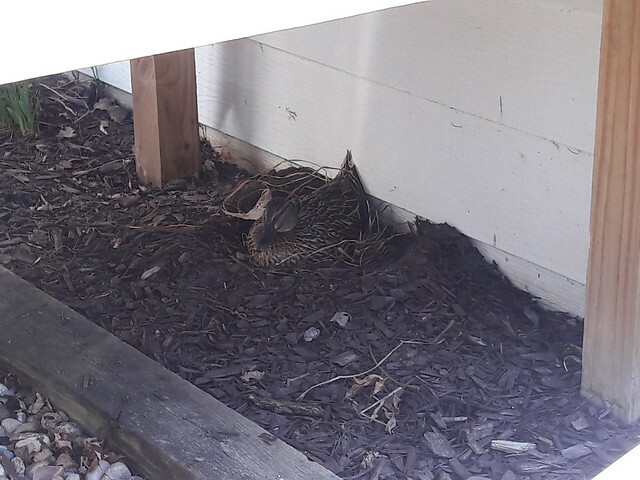 First of all, a few days ago we noticed that something had been digging around in the mulch beneath the steps out back and the other day my wife saw a male mallard duck on our neighbor's roof. We don't normally see ducks on pitched roofs. This morning it all made sense when Kate noticed a female mallard under the back steps. She had fashioned a nest, and the roof where the male was overlooked the area. Still, we needed to go about getting things done outside for ourselves. She was undisturbed by our several trips in and out before we left to run several errands, but when we came back and pulled in the driveway my wife saw her fly off. Not necessarily unusual, and it gave Kate a chance to add new mulch to areas between the steps and the house. While down there, she noticed there was at least 3 or 4 eggs in the nest, so she left the area alone and even put more hay near the nest so the mother duck may use if needed. It's been several hours now and she's not back yet so we hope she didn't get scared off. Oh, and it's illegal for us to mess with the nest, too, my wife looked it up. Not that we would do anything to it, but we do need to use our back yard. Besides mulch, my wife also got some work done in the garden. Speaking of the garden, I posted pictures and a yard tour over at the garden blog a couple days ago, if you fancy a peek. It was nice to take pictures with no snow in them. We also made some headway on the fire pit. 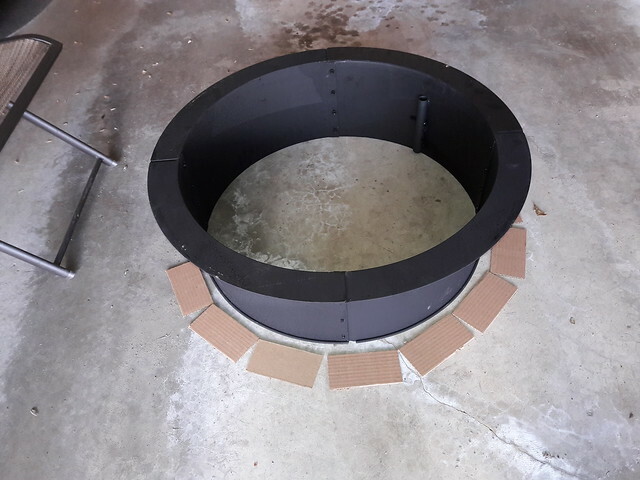 Last week I got the screen top, a couple days ago I put the fire ring together and today we went and got the blocks for it and an adhesive made for outdoor fireplace blocks. A total of 94 - 3"D x 6"W x 2¼"T blocks, total. It was supposed to be only 90 but I miscounted and they didn't check so I stole less than a buck and a half's worth as they were only 32¢ each, oops. And they're actually not even landscape blocks but pavers, they were more the size I was looking for than I could find in landscape blocks. In the picture you can see my scientific way of figuring out about how many blocks to get - I cut out 14 cardboard pieces the same size as the blocks I wanted and laid them around the ring. It should be 16 blocks in a circle and 5 levels of blocks. This comes to only 80 blocks, but they're really inexpensive and I wanted some extra for the bottom of the fire pit to help airflow. I may even use the bottom grate from the fire pit we have now. No matter what I use, fire will burn in it. 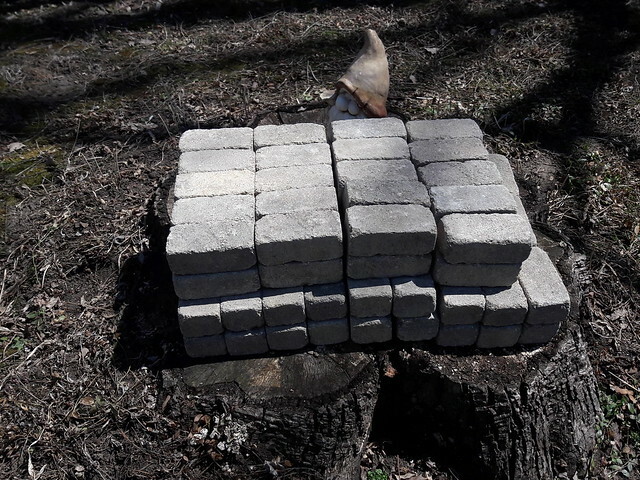 I figured the easiest place to store them for now was on the stump, close to where they will be used and also guarded by the gnome. Without scaring away the ducks. Silly mallard! Has she returned? Hope the fire pit building is going well and not playing havoc with your back. And hope your back is less painful and debilitating now. I knew there some math that could help, but I really needed to visualize it, too, and it didn't take long. Maybe next weekend for the build. Otherwise occupied this today - post coming soon! And the back is doing better, thanks BW. I'm still uncertain of what's to come but I see the neurosurgeon again in a couple days. Life goes on, as you see, but it has certainly been more comfortable in the past. And yes! The duck did return! Once she has laid all her eggs, which may take several days, then she will start incubating them and stay mostly on the nest for about 3 weeks, I'm told. Happy 6th, Basil and Hamish!